Karen Hudson lives in New York City and plays her own fresh brand of countryrock, which often features a pedal steel guitar, that makes her an urban cowgirl! She doesn't wear a hat though, as we can see in the gorgeous black&white photographs of her new EP's lay-out. 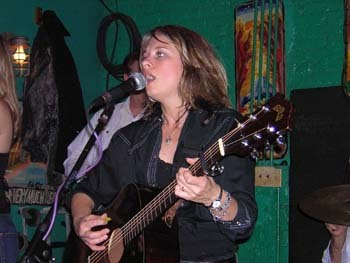 "Hudson River View" is not a debut, she made already an acoustic-based album in 2000, "Bittersweet". Karen doesn't focus on music alone, she's an author and graphic designer, she also hosts The Inwood Coffeehouse for music and poetry. I like her smart puns regarding last name Hudson in the album-title, even in a song and she performs with the Karen Hudson River Band. Opener "I Thought I'd Die" is a fast, upbeat song with lots of pedal steel, while "If You Were Mine" is slow and somewhat sentimental, just listen to that "oohlala" chorus in the background! "Hudson River Blue" turns out to be my favorite, Elena Skye (Demolition String Band) plays a wonderful mandolin part here and the lyrics paint a fascinating picture of feeling blue on the boards of the Hudson River, with a wink at Tammy Wynette: "It's hard to be a woman and my own person too". "Lovesick Blues", one of Hank Williams' best known songs, is almost unrecognizable the way Karen skillfully makes that old song swing. "Honky Tonk Merry Go Round" is another cover of a country classic, followed by a hidden track. No left-over or just a little joke, no, this is a full-fledged ballad with smart lyrics about saying goodbye to a person that's not good for her. Here we also get another excellent chance to enjoy Karen's voice, which is somewhat reminiscent of Linda Ronstadt's in her heyday. Listening to Karen's album is definitely worth your time and for those of you with a short attention span: Yes, it's indeed conveniently an EP!